The U.S. Environmental Protection Agency’s Cross-State Air Pollution Rule (CSAPR) and Mercury Air Toxics (MATS) Rule require power plants to install technologies that reduce sulfur dioxide, nitrogen oxide and other harmful emissions. Federal environmental regulations such as these often require compliance on restricted timelines, forcing some utilities to make significant investments over short time periods and causing sudden jumps in electricity rates for consumers. 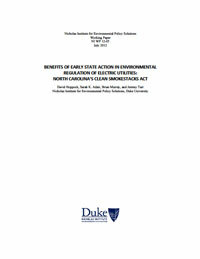 This report examines the ratepayer impacts and health benefits of North Carolina’s Clean Smokestacks Act, a law passed in 2002 requiring emission reductions similar to MATS and CSAPR. The law allowed North Carolina to stagger the cost of pollution-control technologies over a longer period and positioned the state well to comply with the EPA rules while enjoying health benefits and avoiding a sudden spike in consumer electricity rates.